Last month I wrote about Cottage Magpie’s green challenge but this month I decided I would play along and share some of the yellow things in my home. 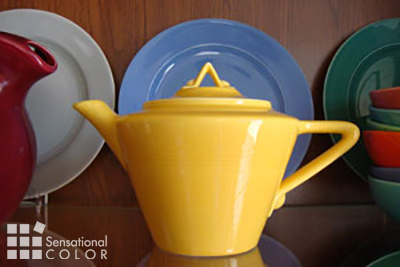 I have lots of yellow kitchenware from the 40’s and 50’s. 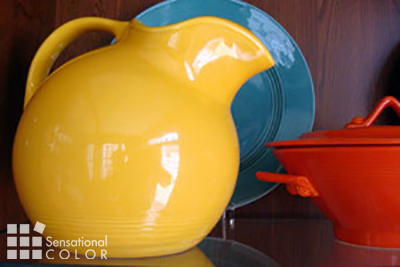 I started collecting Harlequin dishes and Hall pitchers when I was in college and still enjoy them. 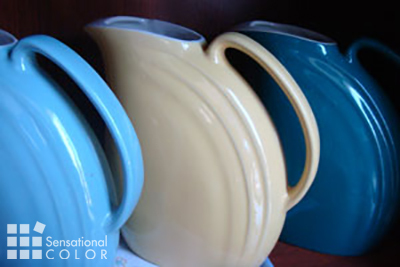 The Harlequin teapots are my absolute favorite and I have them in 9 or ten colors. 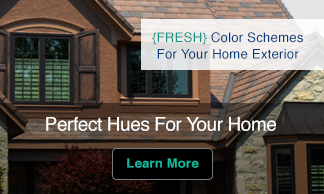 I just love the pointed handles and bright colors. 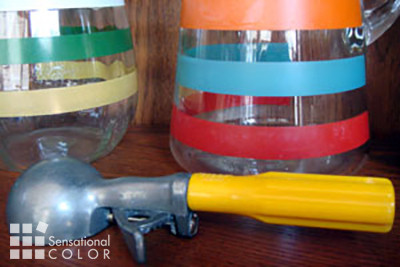 The Harlequin water pitcher is also an item I like and have in many colors. I have several Fiesta pitchers but parted with my other Fiesta pieces. You can only collect so many things. 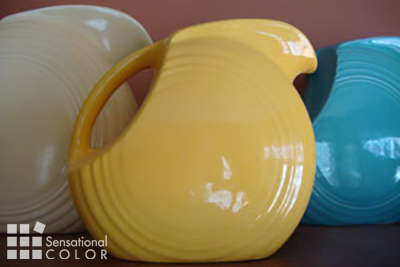 The yellow in this style Hall pitcher is a much lighter and more muted yellow. Do you get the idea I like having the same items in lots of colors? The same is true for my wardrobe. 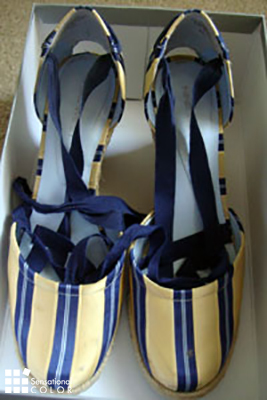 When I find something fabulous that fits well I often buy it in more than one color. This yellow ice cream scoop reminds me of some fun times at my grandmother’s house when we would make ice cream sundaes or root beer floats. 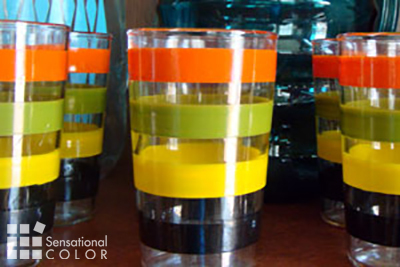 As you can see in the background above and in this picture stripes are another favorite especially in these vintage glasses and pitchers. When we lived outside of Boston my son and I would go to the Cranberry festival each year. We would scoop up the bright red berries right out of the water that flooded the bogs and eat them on the spot. They were so delicious and not at all like the ones you buy in the store. You know an eight year old wouldn’t be gobbling them down if they were too tart or sour. 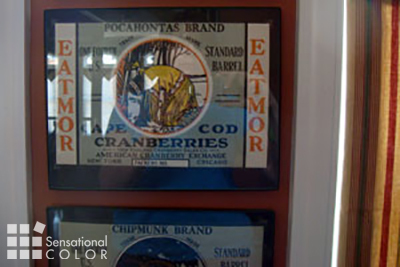 Pocahontas wears a yellow dress on this vintage cranberry crate label. I have five different cranberry labels all from an old factory on Cape Cod. You also get a glimpse of my roman shades that are gold, terra cotta, green, with a hint of black. Contrary to what you might think I usually use white lights for my holiday decorating rather than the multi-colored lights. However, I do have a place in my heart for the colored lights that decorated our tree when I was a child and have dozens of antique Christmas tree bulbs. Here I pulled out a variety of yellow ones. My duvet cover has yellow, gold and teal on a cream background. 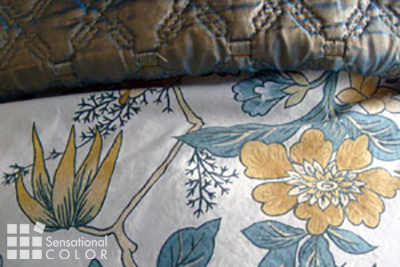 I love this color combination and snagged the cover and two matching pillow shams last summer on sale as Pottery Barn. It’s hard to see in the picture but I have this two-tone gorgeous silk quilt in teal/gold but didn’t even think about these two pieces working so perfectly together until I got home. 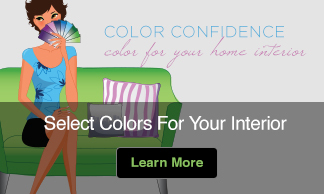 We all seem to have color combinations or color schemes that we are attracted to over and over again. Gold/teal is one of those for me. 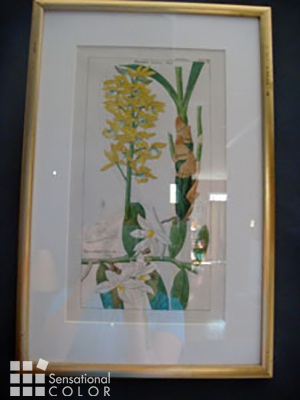 This is an antique hand colored botanical. I started collecting these prints just after college so I was able to buy quite a few before they got popular…and pricey. I wish I was as good at spotting stocks to invest in. So thats a bit of the yellow that shines with optimism, enlightenment, happiness, and inspires creativity in my home. Is it any wonder that sunny yellow makes me smile so easily? Speaking of which it’s a absolutely perfect sunny Spring day here in DC so I’m going to put on my yellow espadrilles and head outside and enjoy this beautiful afternoon. I’ll see you back her tomorrow. P.S. 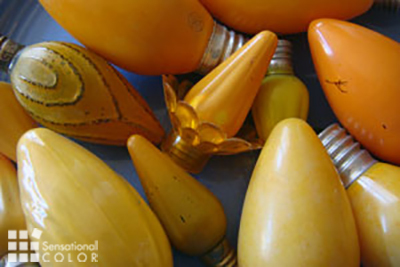 If this post hasn’t quenched your thirst for yellow head on over to my ‘All about the color yellow’ page. I love your yellow! I cannot believe I didn’t think to include my yellow fiesta pieces!! I’m not surprised you share my love of 40s/50s pottery. You’ll have to share your Fiesta on your blog one day soon. Maybe for one of the upcoming color challenges. Thanks for stopping by again. I’ll be coming over to take a peak at your yellow post shortly. Hi, I just came over from Cottage Magpie and I must say that yellow teapot is devine! Oh! Love your cool yellow shoes Kate!! I also like your striped glasses! Everything is so cheerful looking! Those espadrils were worth the trip to your blog! They are darling! Thx for the primer!